In this August 9, 2014 file photo, chickens gather around a feeder at a farm in Osage, Iowa. 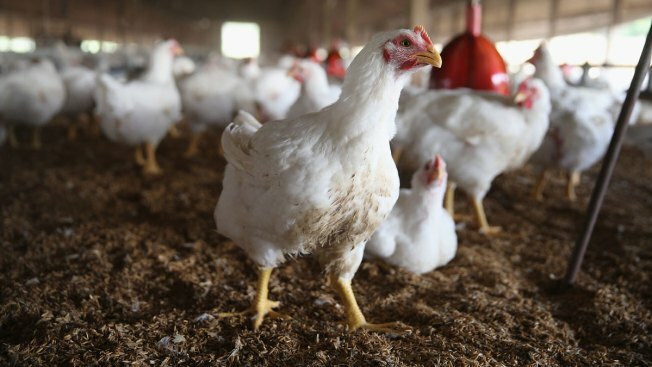 While President Donald Trump unravels many of the policies put in place during the Obama administration, the poultry industry has been lobbying hard to speed up poultry inspection lines, NBC News reported. The Obama administration rejected the idea to speed up the process, capping it at 140 birds per minute, after warnings that doing so could increase food contamination and endanger workers. Most poultry plant employees use sharp tools to eviscerate animals with foreceful, repetitive motions at high speeds, becoming exposed to toxic chemicals used to kill bacteria. "Even at existing line speeds, it's extremely unsafe," said Debbie Berkowitz, a senior fellow at the research and advocacy group National Employment Law Project. One congressional Republican pushing to change the rules, Rep. Doug Collins, R-Ga., asked the secretary of agriculture for the increase, citing a wish to be competitive with other countries.